If you are a busy mamapreneur trying to start & grow your online biz during nap time, this guide was made just for you! I know how hard it can be trying to do it all- build your site, fill it with awesome content, market yourself, get traffic, monetize – I could go on & on. I know you are wondering how the heck to get traffic to your site since seo & building a following on social media can take months to see results! The secret is Pinterest, an amazing platform that’s more like a search engine than it is a social media. The best part- because it is similar to Google, your content can be found even if you don’t have very many followers, just by putting your content in the right places at the right times. ? Setup Your Tailwind for Easy Batching! Download Now to Setup Your Tailwind in Just 2 Steps for Easy Breezy Batching! This post may include affiliate links, which means I will receive a small commission, at no extra cost to you, if you make a purchase using a link. Please see our policies. Are you ready to stop wasting your time & learn the inside scoop on getting traffic to your site? I use an amazing automation tool called Tailwind which I just set up once a month to get daily traffic to my site. Before we get into exactly how I work this magic, I wanted to let you know that you can totally use these same strategies even if you haven’t paid for it yet, by using the Tailwind Trial period, where you get the first 100 pins free. 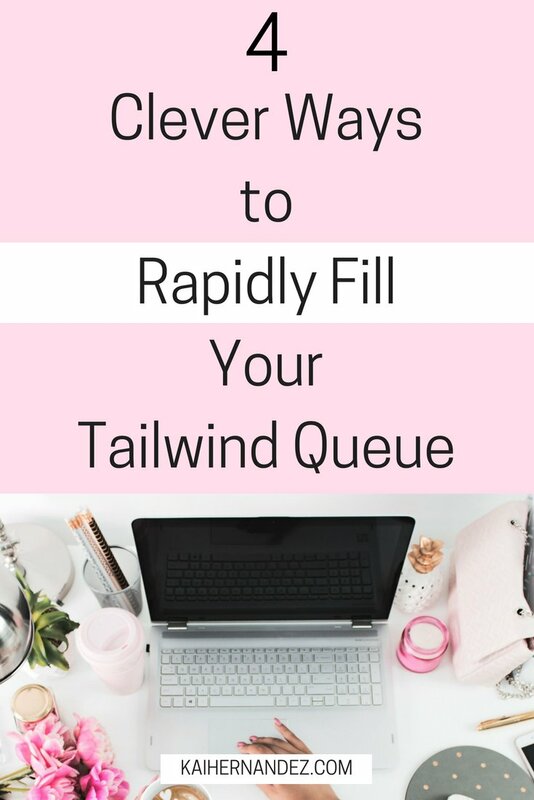 Once your Tailwind account is optimized for batching, the only thing left to do it to figure out what to put into your Tailwind Pinterest queue! A Tailwind Tribe is a great place to join other pinners in your niche & share each other’s content! 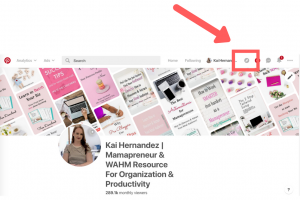 If you join the right Tribes, they will be overflowing with awesome, relevant, viral pins that will actually boost your Pinterest monthly views & make Pinterest look at you like ?! You won’t want to forget to fill these into your queue! Because these Tribes live on Tailwind, it is insanely easy to schedule new content into your queue. When you enter a Tribe, the first page that will open, is a feed of all the fresh content other members have added. By simply clicking Type a Board Name, a list will appear fill of the Board Lists you have created & all of the boards you are a member of on Pinterest. Notice a board missing? Tailwind makes it easy, so all you have to do is click the Refresh Board List button at the top of the list which will pull any new boards, group boards, or Board Lists you have added to your account. Honestly, once you get into this routine, scheduling your own pins in the thing you are most likely to forget! This will take the most time depending on the niche you have. 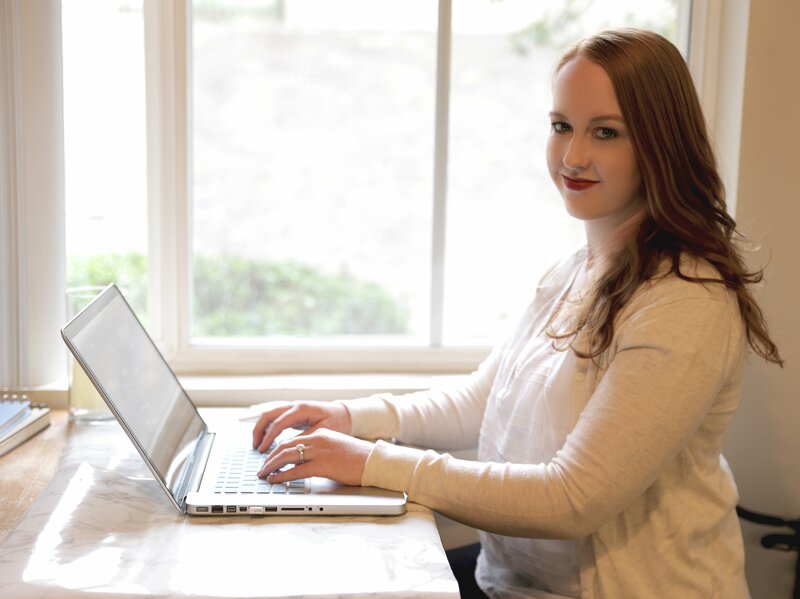 If you have more than one category/niche you will have to repeat the following steps for each one, but don’t worry there are some easy ways to speed up the process that I will break down for you. ? I promise the rest will be a breeze, so do this one first so you don’t forget it like me! Goal Crusher Tip: If you have multiple categories/niches, create a section on this board for each one & fill it with all of your related pins. Take each of your own pins & schedule them to your own relevant boards & relevant group boards. If you created your Board Lists well, you would just need to select a board list! 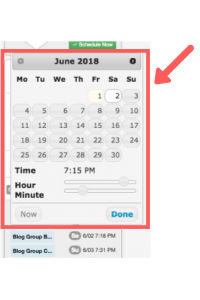 If you will be scheduling all the pins in the section to one board list, you can simply utilize the Tailwind extension for Chrome to draft all pins for that section at one time. Goal Crusher Tip: Make sure to move your cursor over each one of the pins before hitting the extension to make sure the URL for each pin is picked up. At the bottom left, right next to schedule, you will see the button labeled use interval. This will allow you to set up an interval (or a gap) between the times this pin posts to each one of the group boards you have listed. 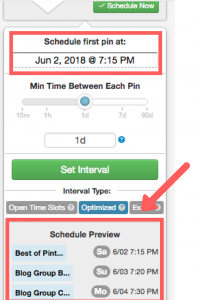 For the first pin I schedule in that category, I like to set the interval to start the very next day, keep it to just one day between posts, & hit optimize. 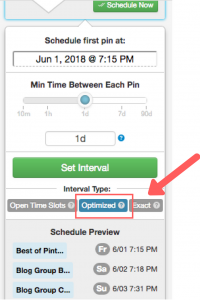 Instead of optimizing (letting Tailwind use its super smart stats to decide what time is best to pin to each group,) you can set it to post during the open time slots within that interval, or set at the exact time you have the interval set for. Next, schedule the next pin that covers the same category, or that you will schedule to the same Board List & repeat steps 1 – 4. 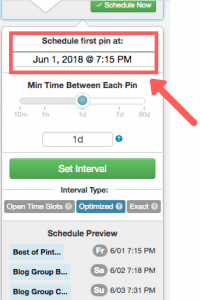 Once you have optimized the interval, you want to change the start date by selecting the date currently under Schedule First Pin at. A calendar will then popup where you can select a new start date. I like to choose the very next date after the one you set up for the prior pin. This will keep you from spamming the group boards on that Board List by staggering each pin one day. You will see the dates shift one day later in the Schedule Preview at the bottom of the image. If you didn’t utilize sections to sort out your pins by category beforehand, you will need to go back thru & make sure you have selected all of the pins for that category. Make sure each time, that you space out the interval to the next date so you aren’t spamming anyone! Keep going thru this until you have scheduled them all! If you have those sections working for you, you will be done in no time! All Done? Awesome! Now the rest of it will fly right by! Remember all of those boards you created when you first got on Pinterest? When was the last time you added content to them that wasn’t your own? With Pinterest, we have a tendency to focus on marketing to group boards. If you are anything like me, you will find this step quite easy to forget! DON’T! This step will help get more views on your own boards, which helps you out in a few different ways. First, since you are posting relevant pins to that board, it helps Pinterest understand the type of content that is related all together on that board, or what that board is about, & when it comes time to post your own pins to that board, it makes it easier on Pinterest to understand what your pin is about. 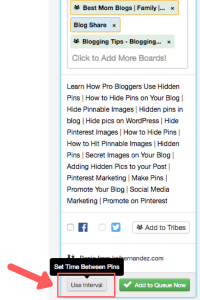 Another way it helps you is that users who save the pins from your own boards are more likely to be shown related content, like your own pins that are on the same board! My point? Pinning to your own boards consistently matters! Before we get started here, it’s important to understand how many pins you actually need per board so that you don’t have to repeat the process, trust me, I have done that before & it can be very frustrating to think that you are finished just to see that you need to go back again. Let’s do it right the first time & not have to come back for an entire month! So you need to know a few numbers before we can begin. 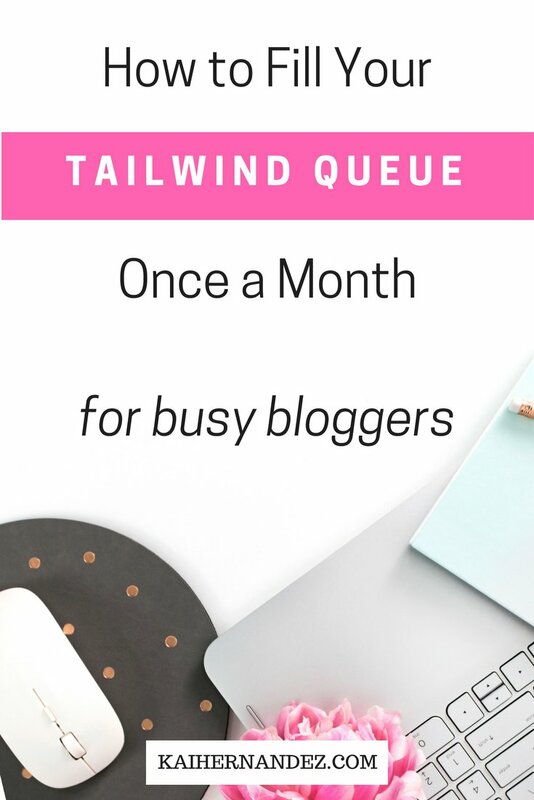 First, how many pins do you have Tailwind scheduled per month? Let’s say you set up your schedule to pin about 15 times per day, multiply by 31 (since 31 is the most days you can have in a month) & you have about 465 spaces to fill! Third, you will use these two numbers to figure out about how many pins you need to schedule for each niche board you have. Take the first number (the number of pins you have scheduled for the month) & divide that by the number of niche boards you have on your profile. Now that we know how many pins we need to schedule per board, we can get started! You will have one tab open on your profile, sitting on the Boards page & the second tab to the Pinterest main page so you can easily search. On your profile, look at the first board you have listed. Make sure that isn’t a group board or focused on only your content (aka not a dedicated board), you want to skip those boards for this batching. Go over to the second tab & search for pins directly related to this board. Try searching for related keywords, or even keywords you use in the board description. You want to scroll down, for how long depends on the number you came up with in step 1 for how many pins you need to schedule per board. You want to catch all the pins you need for that board in one go, so make sure you scroll down far enough. Goal Crusher Tip: Make sure you pass your cursor over each pin so that the Tailwind extension picks up the URL, otherwise you may have some pins missing the URL in the next step. Now that you made it down far enough, hit the Tailwind Extension. A new window will pop up. If it is blank at first, just give it a few minutes to load everything. I find that when I scroll pretty far down after 100 pins or so it can take a little time to pull all of that information into the Tailwind extension. Now you are going to click any pins you want to schedule. You will see a blue border highlight the edges after you select the pin. Make sure they are related to that specific board topic & are quality pins. Beware any sponsored pins, they can be quite off topic. Also, check if the pin has a caption, Tailwind will require that you write in any missing captions, so I just try to avoid selecting them to begin with. The Tailwind extension helps you out & shows you the number of pins you have selected in the bottom right corner. Make sure you have some extra selected just in case you need to remove some because they: aren’t relevant, have no description, or have no URL. If you didn’t move your cursor over each of the pins, the URL of a few of the pins may have disappeared, so you will have to remove those from your queue in order to schedule. Now you are going to click the Type a Board Name box & select the board you chose to search for in step 3. Take a second to scroll thru & delete any pins missing the URL, descriptions, or just aren’t relevant. If you hit “Schedule” it will let you know if you have any pins missing the URL or description remaining. 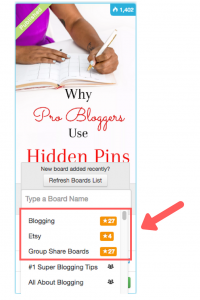 Now you just go to the next board & repeat steps 3 – 10 until you have scheduled pins for each niche board. Awesome! You did it, you got all of those boards some fresh content! Remember in that last session where we scheduled all of your own content using lists on an interval? Don’t worry, your hard work is SAFE! They will not be shuffled! Now you have your niche board content spread out to separate days, your own content going to group boards on an optimized interval, there is just one thing left to really help you rock Pinterest! 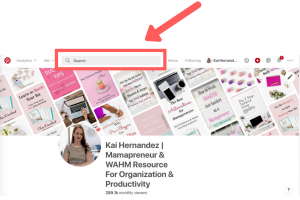 This is similar to the last one in that you are scheduling content to your own boards, but instead of searching, you are going straight to the Trending section on Pinterest. This will help much like the relevant content does, but it will just give you pins that you already know have traction! There are a few different ways to go about this. By simply scrolling down the Trending section you can select relevant pins to add to your queue by hitting the little Tailwind symbol that appears in the corner of each image when hovering over it. This is the more specific way to bulk niche specific content to your boards. Find a category on the Discover page that is related to your niche. If you aren’t sure which category to choose, check out the content on some that are the same category you have selected when setting up your boards. Once you have found a category that has pins related to your niche, its time to repeat the steps from scheduling relevant pins, by selecting only pins related to your niche & scheduling them to your own boards. Whew! We covered a lot! Let’s take a little dance break to celebrate ?? There are so many different ways to share your content, boost your stats, & bring traffic to your site. The best part is that you can set it up so you only have to go in once a month! I love playing with my daughter knowing that I have traffic coming to my site because I filled up my Tailwind Pinterest queue! Don’t forget to slap the pink button below to snag your free Tailwind Setup guide below to optimize your account for easy monthly batching ? This was so helpful! I love the idea of using sections and board lists for scheduling your own pins. Thanks for sharing! Thanks, Joanna, I’m so glad I could help!